Kareena Kapoor talks about her forthcoming film ‘Bajrangi Bhaijaan’ opposite Salman Khan and her ongoing career. 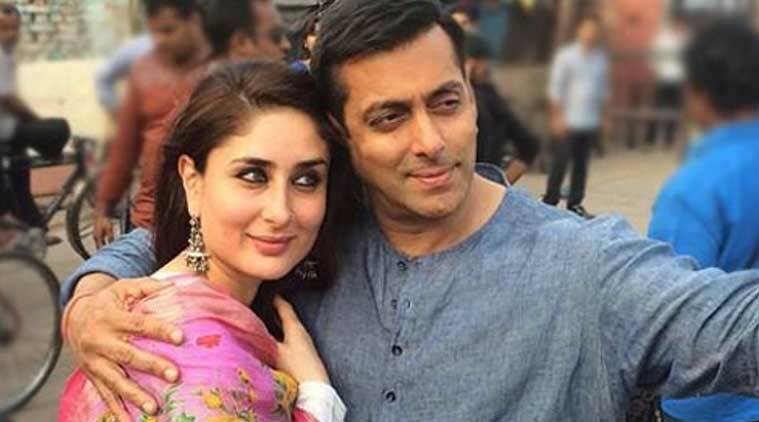 Kareena Kapoor: It was great that Salman offered me a role in his first production. Seated in a hotel on a rainy day, Kareena Kapoor spoke about her forthcoming film ‘Bajrangi Bhaijaan’ opposite Salman Khan, her ongoing career and striking a balance between doing serious content driven cinema and big commercial entertainers. Salman and Kareena share a great onscreen chemistry and somewhat romantic sweetness that was clearly evident in ‘Bodyguard’. The actress prides herself in being his somewhat lucky charm as she has been roped in to be a part of Salman’s maiden production venture. Being one of the top actresses in her own right with string onscreen roles in films including ‘Chameli’, ‘Omkara’ and ‘Jab We Met’, Kareena has seen incredible success with the ruling Khans of the industry – Shah Rukh Khan, Aamir Khan and Salman Khan. While most actresses put films on the back-burner for a while after tying the knot, Kareena Kapoor has been quite the opposite. “People generally think that Salman Khan and all would like to work with a younger actress, but he is working with a married actress and I think that’s a compliment,” she says. 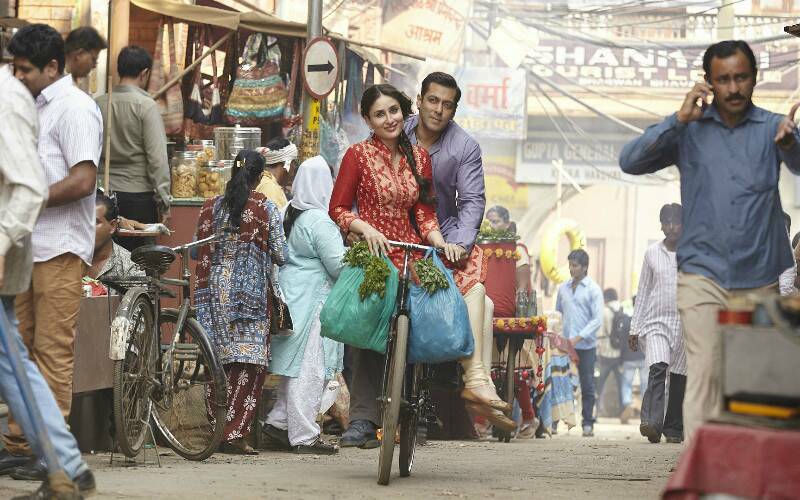 Kareena Kapoor and Salman Khan on the sets of ‘Bajrangi Bhaijaan’. The actress also went on to say that she is entertainer and that’s what she is here to do for her fans. “We are not politicians, but actors and we are here to entertain people. We should not take things so seriously and start giving lectures on women empowerment. I have done content driven films as well like ‘Omkara’, but, I want to maintain a balance between doing women-oriented and commercial cinema because masala films are in my DNA and that’s not going to change,” said Kareena Kapoor. “I don’t care what people say but I love to dance. I’m doing a song in ‘Brothers’ because I enjoy it. If I’m good at dancing and I look good, then I think its great. Trust me, everyone wants a huge commercial film,” she added further. Kareena Kapoor in white top and ripped jeans at the Bajrangi Bhaijaan promos. It’s no secret that Shahid Kapoor and Kareena Kapoor were romantically involved back-in-the-day. As the news of Shahid’s forthcoming marriage is making headlines, Kareena did not shy away from talking about the wedding and even went on to say that she will surely attend the celebrations if she is extended an invite. “I wish him all the best and I’m sure he’s in a happy space because he’s in a good place in his professional life. It’s the perfect time for him,” she said. Talking about Shahid’s last onscreen performance in Vishal Bhardwaj’s film, she said, “I haven’t seen ‘Haider’ but my sister did. She said it was wonderful and he was absolutely brilliant. And I always knew he is a very good actor and always had that spark. Shahid was waiting for that one film and I think he got that with ‘Haider’. Kareena and Shahid will be joining Alia Bhatt and Diljit Dosanjh for Abhishek Chaubey’s upcoming ‘Udta Punjab’. It was in fact none other than Shahid Kapoor who recommended Kareena for the film. “There are no scenes together as it is a three-track story. Our paths never really meet but of course we’re all in the same film as it is a drug drama, but everybody’s roles are very different from each other. I never even shot with Shahid. I am paired opposite Diljit (Dosanjh) and that I’m very excited about it because I am a big fan of his. His videos are amazing and he’s the surprise package of ‘Udta Punjab’. Shahid has a deadly role as well and I’m sure he’s pulled it off,” said the actress. And talking about onscreen pairings, though Kareena and Hrithik Roshan were initially announced as the lead pair for Karan Johar’s ‘Shuddhi’, things did not go as planned. “Karan is a great director and he will make a lovely film. People have been dying to see Hrithik and me onscreen. It’s sad that it didn’t work, but maybe you’ll see us in something else,” said Kareena.